The sale of Manchester United is on! Saudi Arabia’s Crown Prince Mohammed bin Salman, a man riding high on the news cycle for exercising an attitude to journalists that even Sir Alex Ferguson would consider a bit much, is “hoping” to meet Manchester United owners the Glazer family and buy the club for £4bn (Mirror) or £3bn (Sun). The Mirror confirms the story punched out by the trusty Daily Star last week. That scoop was based on“web football forums and Twitter”. So it’s a dead cert to be true. Now the no less trusty Mirror takes up the news cudgel. If it’s facts you want, the paper says Crown Prince Mohammad bin Salman is worth £850bn. Sorry, fact. That’s the only one, and even it’s a guess. The Mirror says the Prince is “hoping” to meet United owners Joel and Avram Glazer in the ­Middle East in the next couple of weeks. Progress, eh. A few years ago, Saudi Arabia banned Jews from entering the country. Now they let them in. If they they let then out again in one piece, we’ll see. 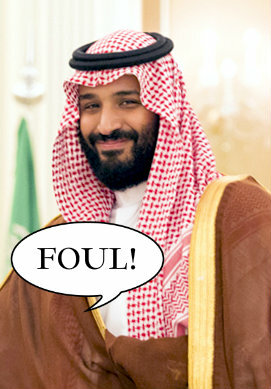 Indeed, as the Mirror notes: “United’s co-owners know that they will have to tread carefully as the Crown Prince is embroiled in a tense diplomatic row over the death of journalist Jamal Khashoggi.” The Saudis say Mr Khashoggi – a critic of the Saudi government – was killed in a fight at the Saudi consulate in Turkey. It’s unlikely the row was about United’s decision to offer Luke Shaw a new contract, but nothing is being ruled out. But will the Saudis really buy United? On the back of this rumour, which the Mirror can’t substantiate with a single quote or fact, shares in the club traded on the New York Stock Exchange rose by over 5% to $27.65. Such is the power of the red-tops that when they spread a baseless rumour, City traders go ballistic. Meanwhile, in Saudi Arabia, local journalists deliver the scores from last weekend’s matches: Chelsea 0, Manchester United 27.